This suite feels inviting and homely from the moment you walk in the door. Your family or friends will love spending time here and it's pet-friendly, so you can even bring your companion with you. The hall has plenty of hooks to hang your coats as you enter. 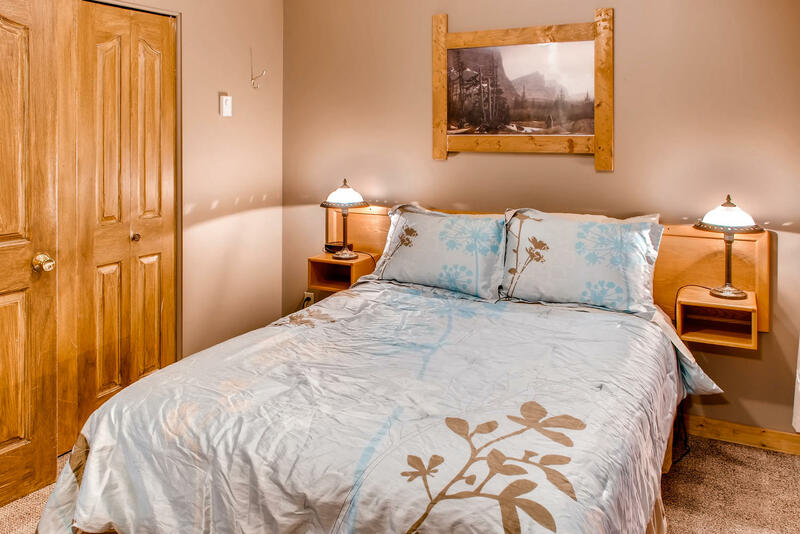 The first bedroom is located off the hallway and has a double bed, wood paneling on the walls and high window to let in natural light from the living space. 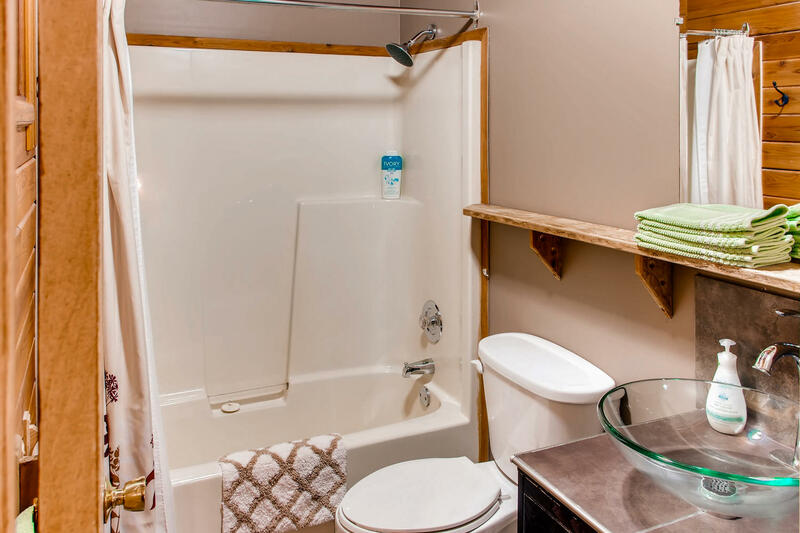 The main bathroom is also located off the hallway and features a full shower, toilet and a new modern vanity with glass sink and stainless steel fittings. 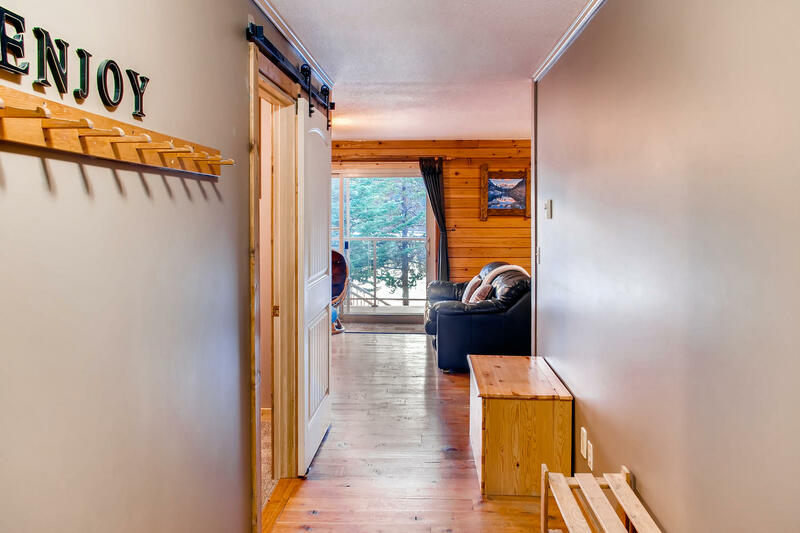 The hallway leads into the lounge and dining areas which look out over the deck and onto the lake. Two sofa beds in the lounge room means there is plenty of space for extra guests or everyone can have a bed to themselves! 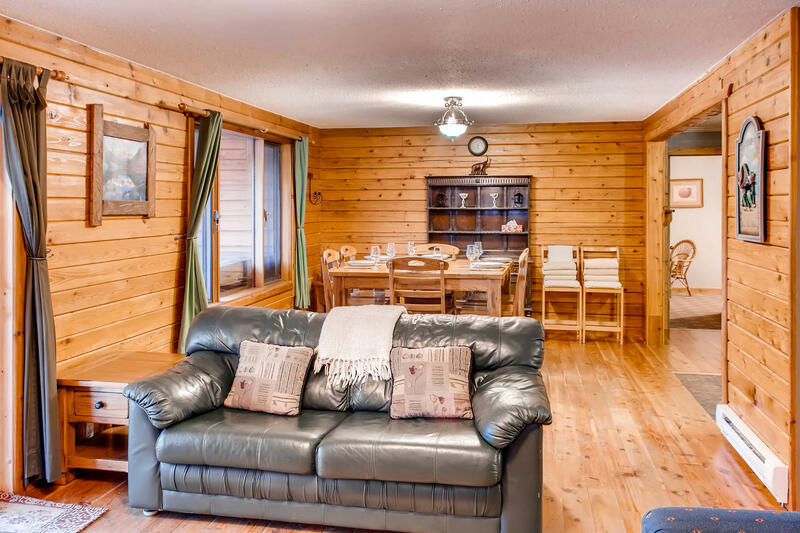 There’s a large flatscreen TV with satellite TV, a cabinet with plenty of board games and electric Fireplace in the corner to warm up by in Winter. 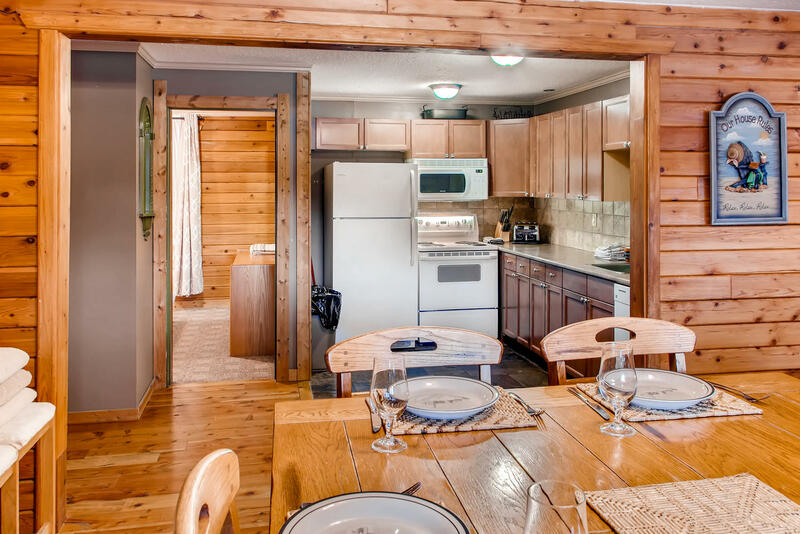 The dining room has a large 6 seat table which looks directly out onto the deck and your private hot tub. 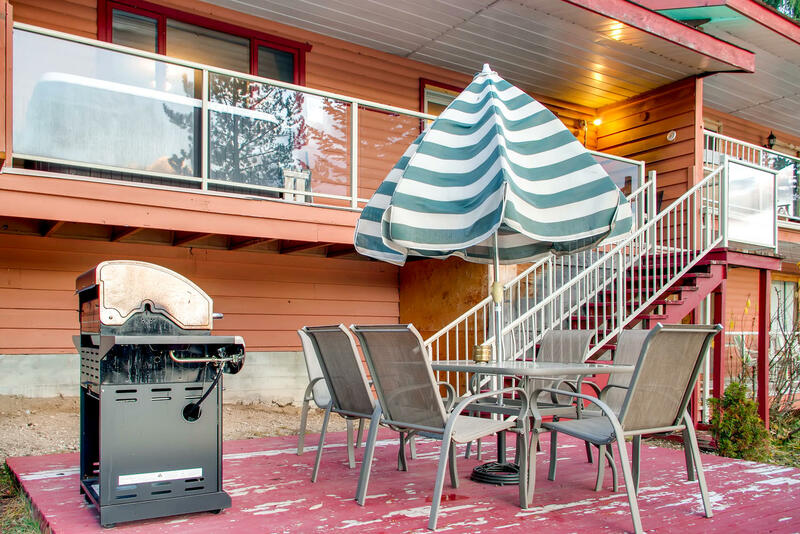 From the deck, take the stairs down to a lower deck, which is the ultimate place for a BBQ dinner and making most of the stunning setting on warm Summer nights. It’s only a hop, skip and a jump down to the lakeside where there’s a small jetty to fish off or launch a boat from. 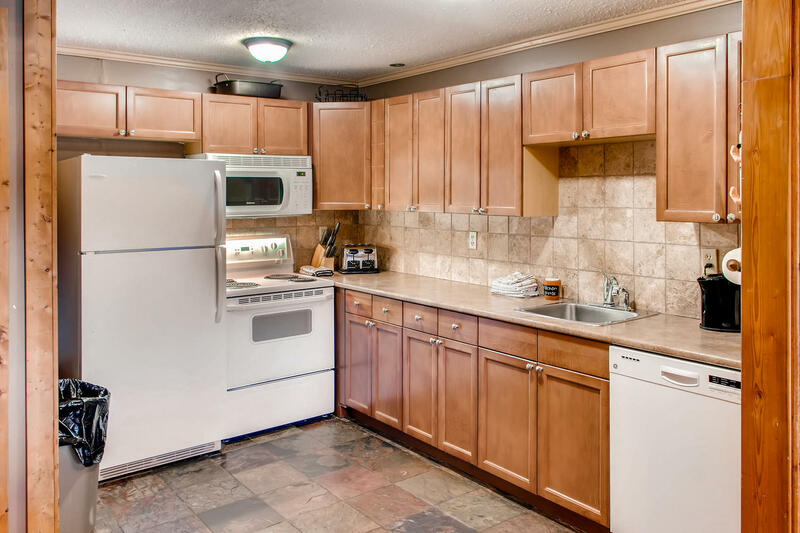 The kitchen is tucked away off the dining area and has a slate floor, large fridge and over with four cooktops, as well as a dishwasher. The second bedroom has a queen bed, chest, desk and large mirror. 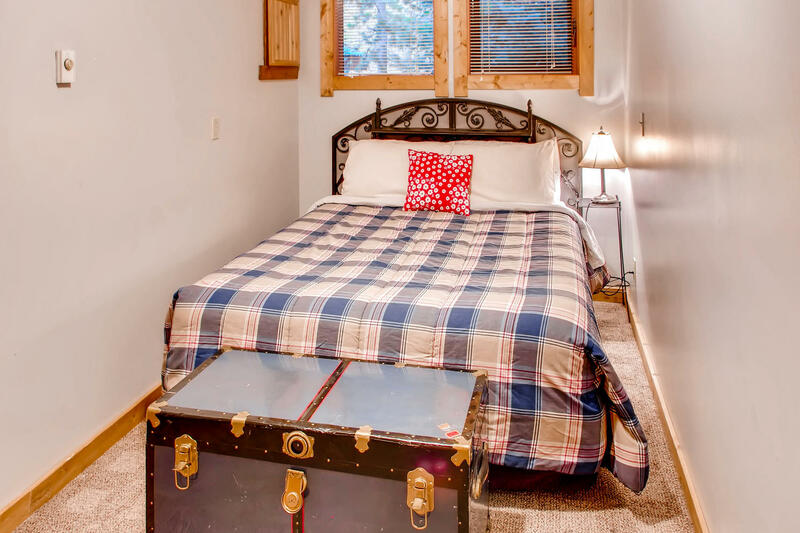 There is also a queen bed in the master bedroom, which has a closet where you can store away your luggage. 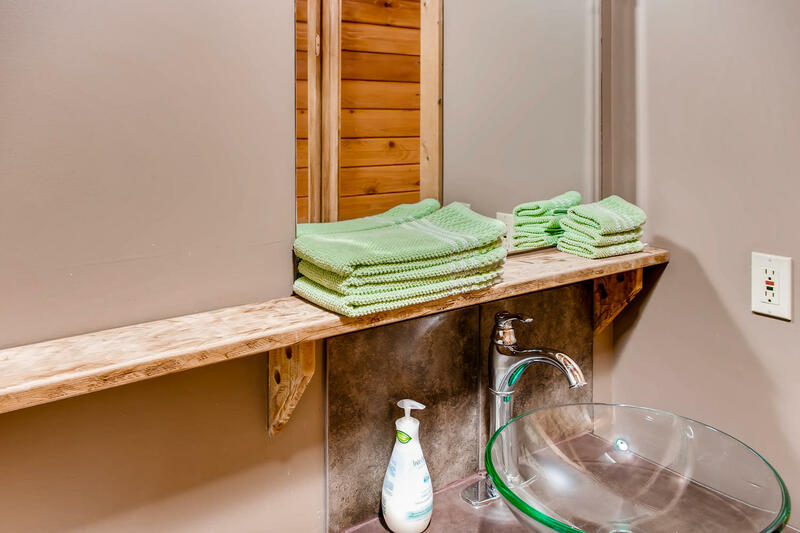 The ensuite has been revamped and has a full bath with shower, toilet and a new vanity and fittings. Reviewed August 10, 2017 by Unknown of Kelowna, BC United States. Updated on September 12, 2017. Review of stay from August 4, 2017 to August 8, 2017. Condo was good size for our multi-generation family stay. Idabel lake is very quiet, peaceful and nice break with no cell phone or WiFi service. Scenic view from balcony with our own pier and row boats and canoes always available free. 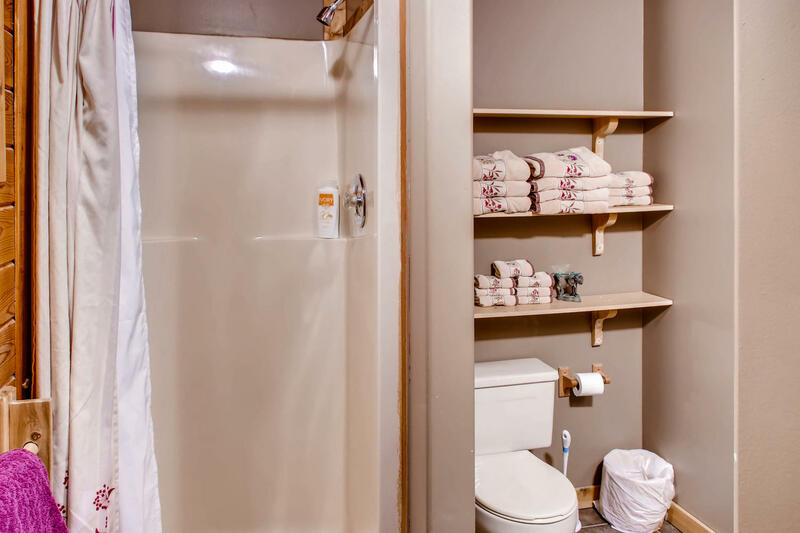 most modern amenities,very clean,fresh bed linens and towels. Reviewed November 7, 2017 by Adina W. of Kelowna, BC CA. Updated on August 30, 2018. Review of stay from November 3, 2017 to November 5, 2017. Love Idabel Lake. Breathtaking views and very comfortable accommodation. The games room and bonfire areas are fantastic any time of year! 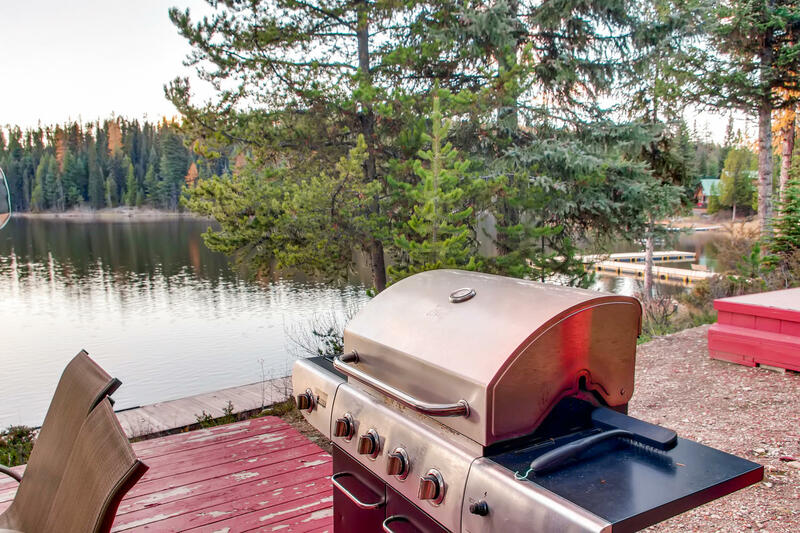 We are so glad you enjoyed your stay at Idabel lake and were able to enjoy the amazing views and peaceful environment, especially at any time of year all while being comfortable. Reviewed December 19, 2017 by Ashley F. of Kelowna, BC United States. Updated on January 17, 2018. Review of stay from December 16, 2017 to December 17, 2017. We had our sons 10th birthday up at Idabel Resort. We all had an amazing time. Beautiful place. Reviewed March 6, 2018 by Chris B. of Kelowna, BC United States. Updated on March 13, 2018. Review of stay from March 3, 2018 to March 4, 2018. Had a group of us up for some relaxation and ice fishing for one night. The rental company was very friendly, the property was just as shown in the photos, and the location was the perfect distance from Kelowna. For the price and in comparison to other rentals we looked at, I would definitely go back again. Glad to hear you enjoyed your time at Idabel Lake Chris, hope you can visit again soon. Reviewed July 1, 2018 by Joanne C. of WEST KELOWNA, BC CA. Updated on August 27, 2018. Review of stay from June 27, 2018 to June 29, 2018. We are glad to see you enjoyed your stay at Idabel lake. It is very peaceful and relaxing and are glad to see you found it well kept. Reviewed April 21, 2017 by Jude B. of Big White, BC United States. Updated on May 10, 2017. Review of stay from April 17, 2017 to April 19, 2017. 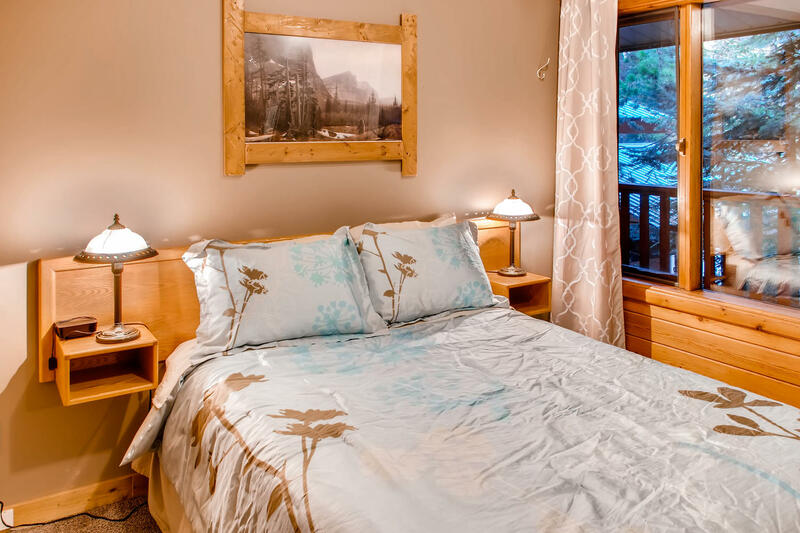 Great location, good amenities, feels secluded and yet so close to Big White! All round great trip away! Reviewed January 16, 2018 by Lynae C. of , United States. Updated on August 30, 2018. Review of stay from January 12, 2018 to January 14, 2018. The location was a 10 minute drive from the Kelowna Nordic ski area (big plus). Kids loved the game room. Walls are thin so noise from adjacent unit was noticeable. Had issues with a power outage most of Saturday evening. Also got locked out of our unit before our check-out time which was complicated by no cell service. But, staff was very responsive, helpful and friendly. Owners in neighboring unit friendly and welcoming. The area is peaceful and beautiful. We enjoyed our short stay and would love to return. We are delighted to hear that you enjoyed your stay as well as the location. There is a phone in the games room for your convenience and are glad we were able to assist you in a responsive, helpful way. This lake is in a remote location and sometimes complication that are uncontrollable can occur, but it is this location that enable it to be the tranquil and peaceful environment it is. We are so glad to hear you got a first hand experience of what it has to offer and that we were able to solve your complications without too much disruption. We would love to have you stay with us again and if we can provide any assistance, do not hesitate to ask. Reviewed August 2, 2018 by David P. of Calgary, AB United States. Updated on August 26, 2018. Review of stay from July 22, 2018 to July 28, 2018. The suite was ideal for our family and was clean and in good condition. That cannot be said for the infrastructure though. I understand that there had been heavy snowfall this past winter but that is no excuse for loose railings protruding nails, wobbly stairs etc. Location was excellent though. We are glad you had a satisfying vacation and got to enjoy the quiet peaceful location. We are so sorry to hear about infrastructure not being up to par. We have made a note so that this can be fixed in the future to ensure safety for all our guests. Thank you for your feedback and we hope to see you visit again. Reviewed August 29, 2018 by Michael W. of Kelowna, BC United States. Updated on August 30, 2018. Review of stay from August 6, 2018 to August 11, 2018. Overall an excellent time, everything you need is supplied in the way of cookware etc. Great shower..lots of hot water. The custodian (i think it was Todd) was awesome..very helpful. The only drawbacks were some outer repairs not done yet due to a brutal winter and snow damage. I will return to enjoy another stay without a doubt. We are pleased to hear you enjoyed your stay with us at Idabel Lake. It is a very peaceful location especially when you can hear the loons so distinctly. We are aware of the damages and shall go about correcting the situation and look forward to seeing you again in the future. Reviewed February 7, 2018 by Tami H. of Kelowna, BC Canada. Updated on August 30, 2018. Review of stay from February 2, 2018 to February 4, 2018. 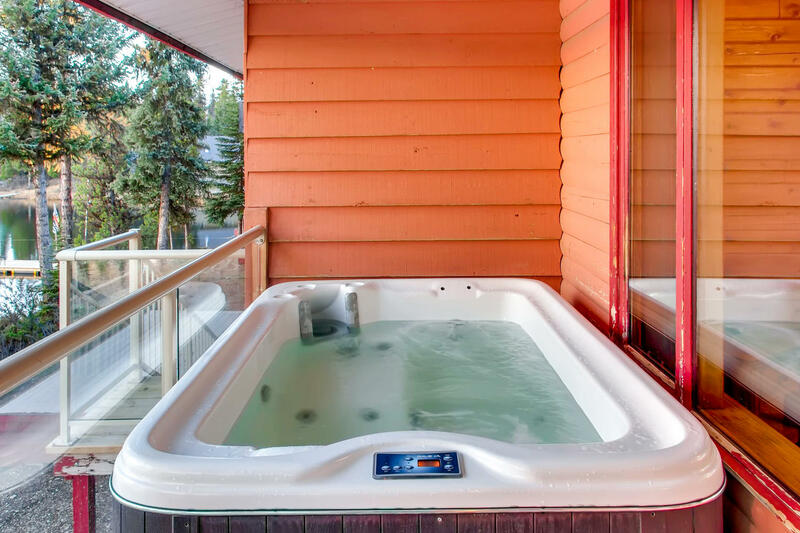 We have stayed in the summit suite before and everything was great but this time there was no extra towels for the hot tub and only 4 bath towels to use all weekend. the patio door doesn't lock with the handle and you have to use the foot lock to lock the door. 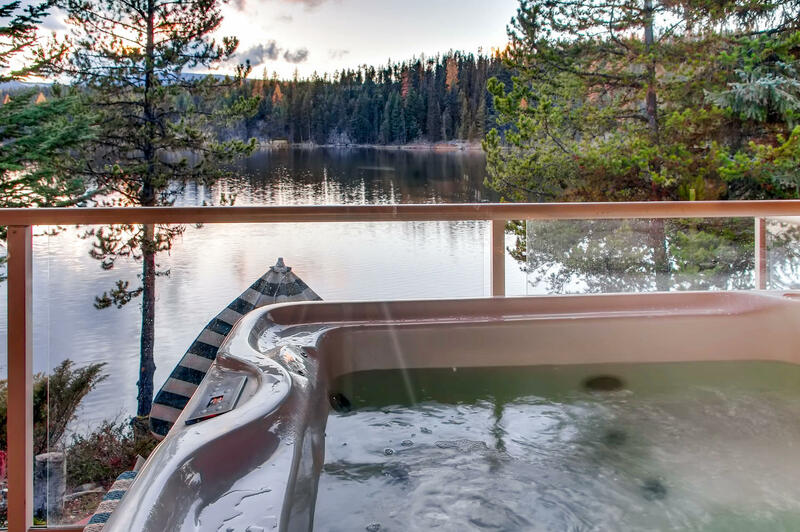 We are glad you enjoyed your stay in Idabel lake and are sorry to hear that you received no hot tub towels or extra towels. If in the future if you ever need anything do not hesitate to call us, there is a phone located in the games room for your convenience. Additionally, there is an automatic refund of your deposit after 7 days, however we apologize that it did not return promptly after your e-mail. It sometimes does take a while for the deposit to be void after we request it, but intend to look into it further as it should not take 3 days. Thank you for your feedback and we intend to correct this so that the future stays are free from error. If we can assist you in anyway in the future, do not hesitate to contact us. Reviewed January 20, 2017 by Brad P. of , United States. Updated on February 13, 2017. Review of stay from December 23, 2016 to December 27, 2016. We enjoyed our stay and plan to continue coming to Idabel for Christmas again. This year I was slightly inconvenienced as I needed internet service due to being "on call" for my job for part of our stay. I ordered and payed for service but was not connected and therefore had to interrupt the manager at 7am experiencing an uncomfortable interaction so early in the morning. Firstly, it was Christmas morning and I had to get up and dress before venturing to the manager's residence. I then had to experience three dogs barking and causing quite a scene as I approached the gate, I then cautiously open the gate making sure the dogs wouldn't escape and knocked on the door to wake the manager up. I was greeted with an angry look, of course it was early and who would want to be disturbed that early. I explained that I required internet and could not get connected. He then apologized and invited me in to work on solving my problem. It was resolved 30 min. after my "on call" had started. He said that this has been a problem for a while. I love coming here for our Christmas and hope to not require internet service next time but would have made previous arrangements for service had I been informed of the issue. I expected a hassle free internet connection because when we drove up internet was offered on my phone immediately. I recommend letting your guests know that if they need service it is not as easy as it appears and that it takes time and possibly assistance. I appreciate the opportunity to provide feedback to you and this experience in no way will deter us from returning. Reviewed June 14, 2017 by Tami H. of Kelowna, BC Canada. Updated on July 21, 2017. Review of stay from June 10, 2017 to June 12, 2017.
relaxing and weather was great. Only thing this suite needs is a fire alarm and the bbq needs to be cleaned. Reviewed June 13, 2017 by Unknown of Burnaby (Burnaby Heights / Willi, BC United States. Updated on June 14, 2017. Review of stay from June 9, 2017 to June 10, 2017. Reviewed July 11, 2018 by Unknown of Summerland, BC United States. Updated on August 26, 2018. Review of stay from July 5, 2018 to July 8, 2018. 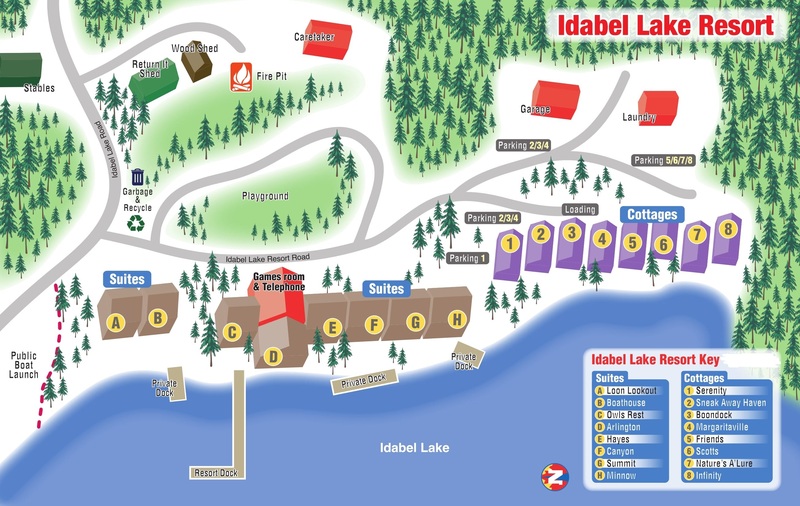 This was our fourth trip to Idabel Lake resort but it has been a few years since last time and we were disappointed in a few things . The screens all had holes or were very bent so couldn't have open as the Mosquitos were getting in which make it uncomfortable hot at night . The second day they brought us a couple fans to help . The BBQ was in rough shape as all the burners were really corroded and one of the burner covers was missing so the flames shot out the back. A new day bed we were told was just out in living room and it was big and bulky , very put of place and not comfy at all to sit on , kinda weird to put in a cabin looked like it belonged in a nursery or something . All else was great , nice peaceful place to get away to and the comforter on bed was great . Will return . We are glad you enjoyed your stay and got to enjoy the peaceful surroundings. We have made notes of your suggestions about the property and will go about fixing the repair needed. We are glad we could assist you during your stay to make it more comfortable. We hope to see you back again at this lovely lake. Reviewed February 21, 2017 by Brooke S. of , United States. Updated on February 27, 2017. Review of stay from February 3, 2017 to February 5, 2017. Overall, the experience was good. The rooms and the house were more than enough space. We had a great time playing hockey, snowshoeing, sledding, sitting around the fire outside. There were a few quirks when we got there that made it to be not a perfect weekend, but overall it was good. Thanks for taking the time to review your stay at beautiful Idabel Lake. We're glad you had a great time and made the most of the beautiful surroundings and resort amenities. We hope to welcome you back to stay at the lake again soon. Reviewed March 1, 2017 by Melissa R. of Vancouver, BC United States. Updated on March 1, 2017. Review of stay from February 10, 2017 to February 13, 2017. I rented the Summit Suite for a long weekend to relax and spend some time snowboarding at Big White. Unfortunately the roads were closed between Vancouver and Kelowna so missed our first night at the rental because we were unable to get there. Overall it was a nice place, good proximity to Big White, scenic area. Luckily the staff on the property was available because the door code wasn't working and they had to reset it a few times. Also, the internet (although listed to be available by purchase) was not working at all. Reviewed March 27, 2019 by Jodi J. of Vernon, BC Canada. 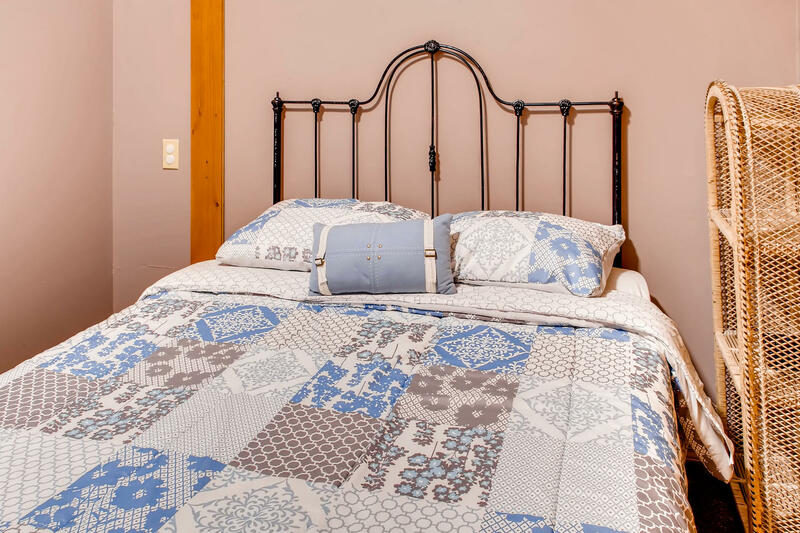 Updated on March 27, 2019. Review of stay from March 23, 2019 to March 25, 2019. Dirty and tired. Stay was disappointing for price.